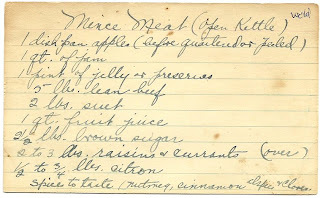 A generous grant from 4Culture is currently funding the digitization and cataloging of several archival collections, include the recipes of Mary Wold, Issaquah resident. Mary Wold had an exciting life, working as a teacher and as a nurse most notably for the Red Cross in WWI in Siberia. Later, she and her sister Sena lived out the rest of their lives in Issaquah. As I sit here eating my store bought doughnut, I can’t help but think this recipe is the most appropriate for the week. Reading through these recipes and trying to decipher some of them makes me wish I wasn’t in the middle of a huge kitchen remodel project in my home. I wish I could taste test some of these recipes before posting about them on here, but I just have to settle for eating their store bought alternative while I compose a list of all the recipes I’ll try out when my new and improved kitchen is finally installed. The title of this recipe, “Mother’s Doughnuts” is kind of ambiguous. 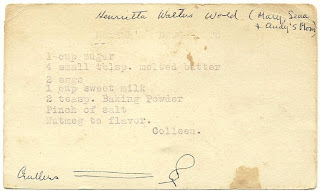 Our good friend Harriet Fish labeled it as Henrietta Wold’s recipe. 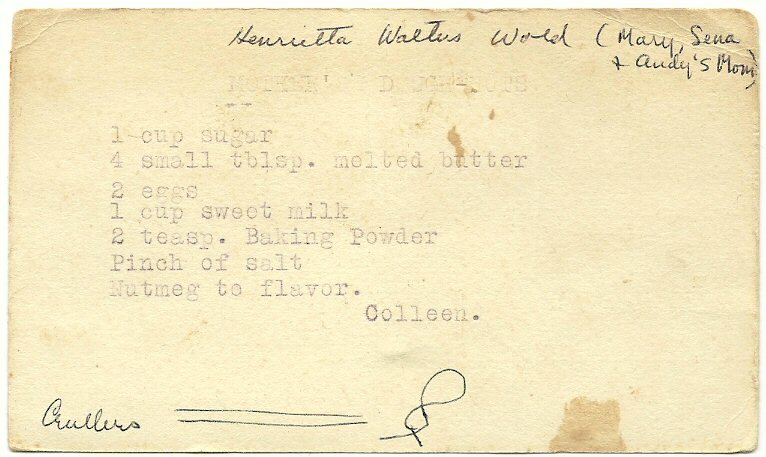 Henrietta was indeed Mary Wold’s mother, but I’m not inclined to believe this is her recipe. My main indication is that typewritten at the bottom of the recipe is the name “Colleen.” It’s unfortunate that we don’t have a last name or anything else to help us decipher who Colleen may have been but through research I have an idea. A good majority of Mary’s recipes come from her friends and women her age. I looked at every Colleen that we had in our Family Tree database and found only one that was in Mary’s generation: Colleen Neukirchen Orchard. While this isn’t a perfect match, I did find that this Colleen attended nursing school in Seattle in 1911. We know that Mary Wold was in nursing school in 1914. Again, this doesn’t fully indicate that Colleen Neukirchen Orchard is the Colleen from the recipe but it’s as close as we may get. If the recipe did indeed come from Colleen Neukirchen Orchard then we have two options as to who “mother” is. Colleen’s mother was Selina Neukirchen (we do not know her maiden name) who was born in France. She died when Colleen was 7 years old. Colleen’s father, John Neukirchen, didn’t remarry until 1909. I’m not certain that at age 18 Colleen would have considered her father’s new wife as “mother.” Anyways, I really can’t be certain about any of this but I think it’s as close as I can get. If “mother” is indeed Mary’s mom (and Colleen is just a random typo…unlikely) then it would be Henrietta Walters Wold. We know that by the time Mary was 14 years old Henrietta was living in Steilacoom, WA at Western Washington State Hospital for the Insane. We don’t know what Henrietta’s condition was but she was in Steilacoom in the 1900, 1910 and 1920 censuses. By 1930 she was back home living with Mary and Sena in their home. She died in 1938. This is all interesting, but it doesn’t help us determine authorship of the recipe. Anyways, now onto the important business – actually making the doughnuts. One ingredient stands out – “sweet milk.” Sweet milk is just fresh milk, generally whole (not non-fat.) When milk went sour in the “old days” people used it in baking, so they would distinguish fresh milk from sour milk by calling it sweet milk. I have never actually had mincemeat and never really knew what it was all about until I saw this recipe. I’m curious to try it, if only because it’s so different than anything else I’ve ever eaten. This probably won’t be the first recipe that I try from Mary Wold’s collection, but it is worth sharing. It is a traditional mincemeat recipe, with beef and suet. I’m not sure how readily available all the ingredients are – like suet and citron. But I imagine with a little research and maybe some substitutions, the recipe can be brought into the 21st century without sacrificing the original intent. As with the other recipes there are some assumptions in this one. It calls for a dishpan of apples – how big is a dishpan? It also calls for jam and jelly or preserves. To me, jelly and preserves do not seem interchangeable. And as with “fruit juice” – what fruit are we talking about? 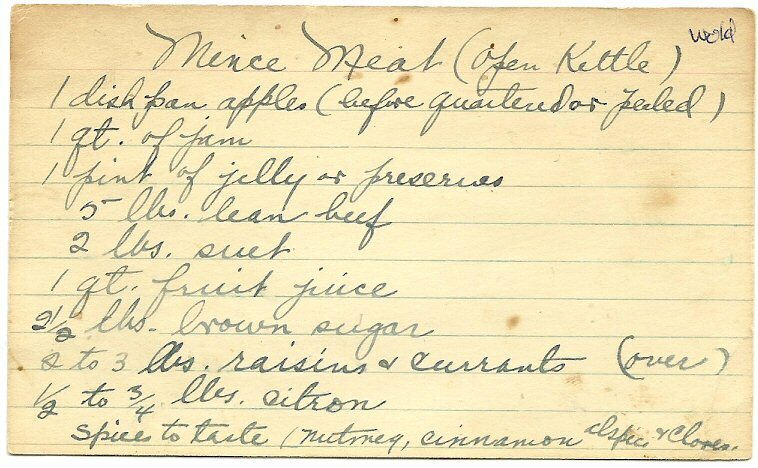 Considering this and other recipes for mincemeat, I’d err on the side of apple or some sort of citrus. 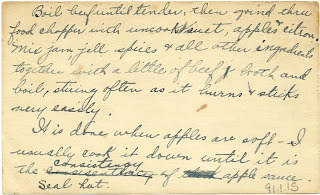 There isn’t a clear author on this recipe – Harriet Fish labeled it Wold but we’ve found that her indications were not always correct. I imagine that the recipe had been passed down through the years considering more modern recipes don’t actually contain any meat. 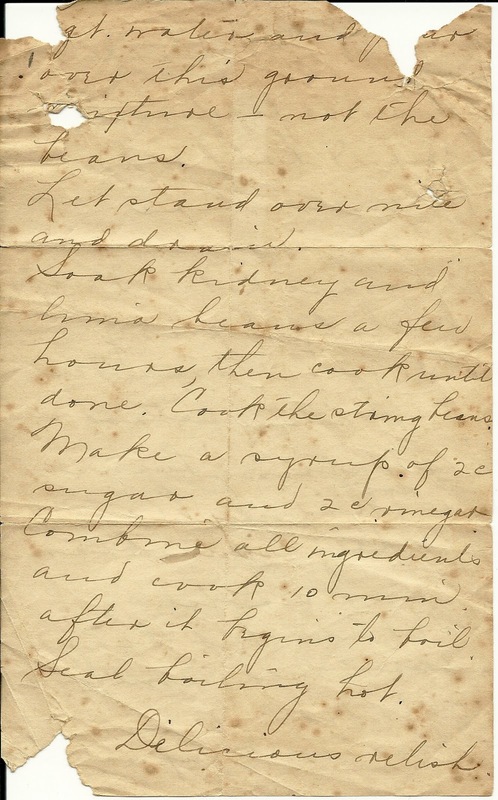 This recipe is actually very similar to a 19th century recipe I found online – which would be right in line with some of the dates of the other recipes in the collection. Boil beef until tender, then grind thru food chopper with uncooked suet, apples and citron. Mix jam, jell, spices and all other ingredients together with a little of beef broth and boil, stirring often as it burns and sticks very easily. It is done when apples are soft – I usually cook it down until it is the consistency of apple sauce. I chose this recipe for Brown Bread as the week’s recipe mostly because I love brown bread. The only kind, though, I’ve ever had is from the can – where it comes out in can form and you slice it however thick you want it (kind of like cranberry sauce.) It was a special treat growing up and I’m curious how this recipe compares to the can version. I’d like to make it and see if it’s as dense and I’m sure I could actually bake it in a can to get that same effect. 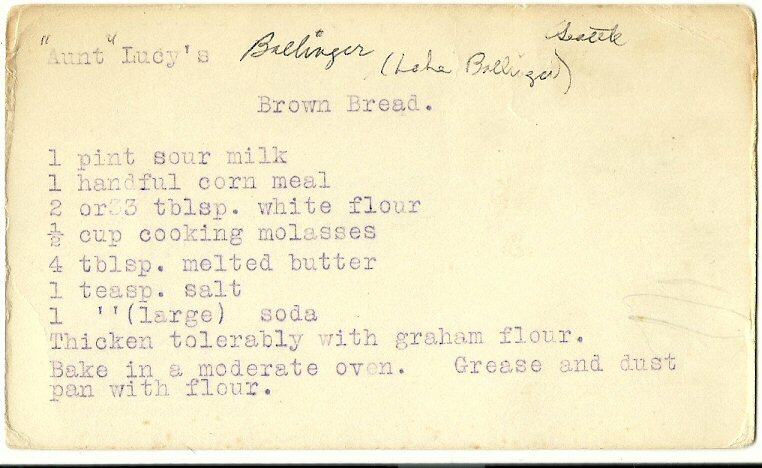 The author of this recipe was identified by Harriet Fish as Lucy Ballinger (although Harriet has written on the card “Leha” Ballinger.) Mary Wold didn’t have an actual Aunt Lucy but Lucy Ballinger was living in the Newcastle/Squak area in 1900 (she was 65 at the time) and then later in Seattle. Perhaps Lucy was the type of woman who was an “Aunt” to everybody. There are some things I love about this recipe. As do most of the recipes in Mary’s collection, they assume that the reader knows how to bake. There are no exact measurements for temperature or length of time. People knew that ovens varied and could adjust accordingly. I also love, after hearing so often, that baking is “an exact science” just how inexact the recipes are. A handful of this, 2 or 3 tablespoons of that, and a different measurement for teaspoon (one regular and one “large”.) 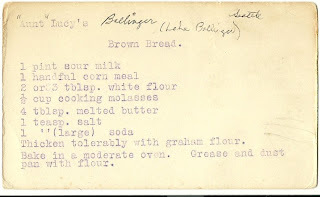 I also love that the dough should be thickened “tolerably” with graham flour. I suppose I won’t know what that means until I make it! Thicken tolerably with graham flour. Bake in a moderate oven. Grease and dust pan with flour. Food is always a subject that peaks interest. What we eat and how we prepare it changes so quickly – think of what you grew up eating, is it something you still prepare? 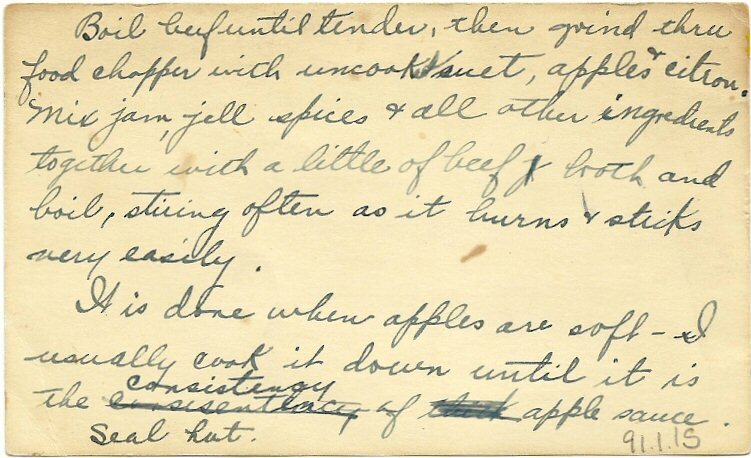 I’m currently sorting out and digitizing some recipes that have been in our collection for awhile. 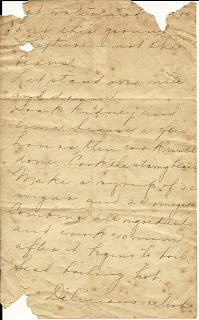 The ones I’ve first started on are from a box of recipes from Mary Wold that came into the possession of Harriet Fish. We have an article written by Harriet Fish to go along with the recipes – the article describes what she first found when she opened the box. Unfortunately, what we have now doesn’t match Harriet’s article – not completely anyways. Recipes are missing and Harriet seems to have added her own. Luckily, we have determined which are the originals to the box and which are the extras added at a later date. But the recipes that are missing are the ones that intrigue me the most. They are mostly main dishes and include such titles at “Codfish a la Mode” and “Welsh Rarebit.” But there are some good ones that remain. I’d like to begin a series of posts containing a recipe and the women behind them as each recipe generally has an old Issaquah name attached to it. 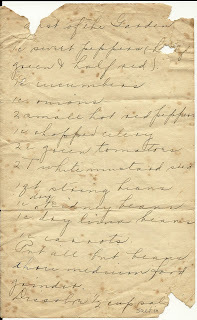 The first recipe is called “Most of the Garden.” The recipe is handwritten on a piece of paper and slowly wearing thin. I chose it as the first recipe because of its fragility (I wanted to digitize it right away) and because it sounds delicious. 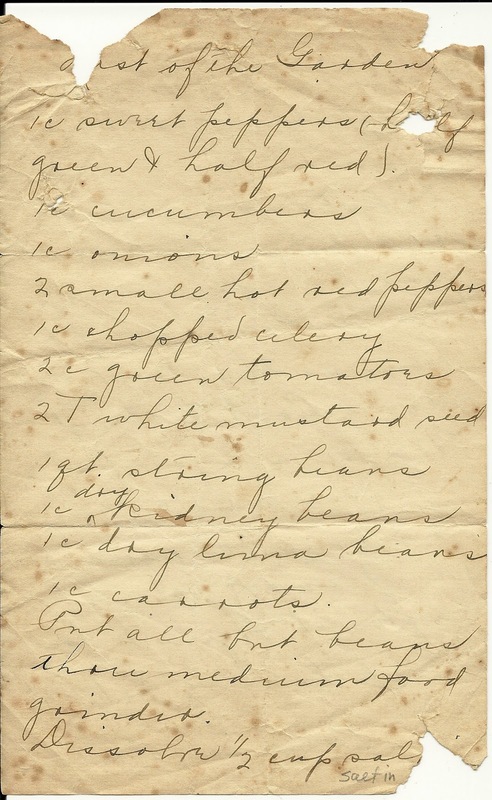 It’s a sort of relish and indeed uses “most of the garden.” There is no attribution on the recipe and Harriet doesn’t say in her article if she knows who wrote it. Nevertheless, I hope to try the recipe myself one of these days. Put all but beans through medium food grinder. Dissolve ½ cup salt in 1 qt. water and pour over this ground mixture – not the beans. Let stand over nite and drain. Soak kidney and lima beans a few hours then cook until done. Cook the string beans. Make a syrup of 2 c sugar and 2 c vinegar. Combine all ingredients and cook 10 min after it begins to boil.